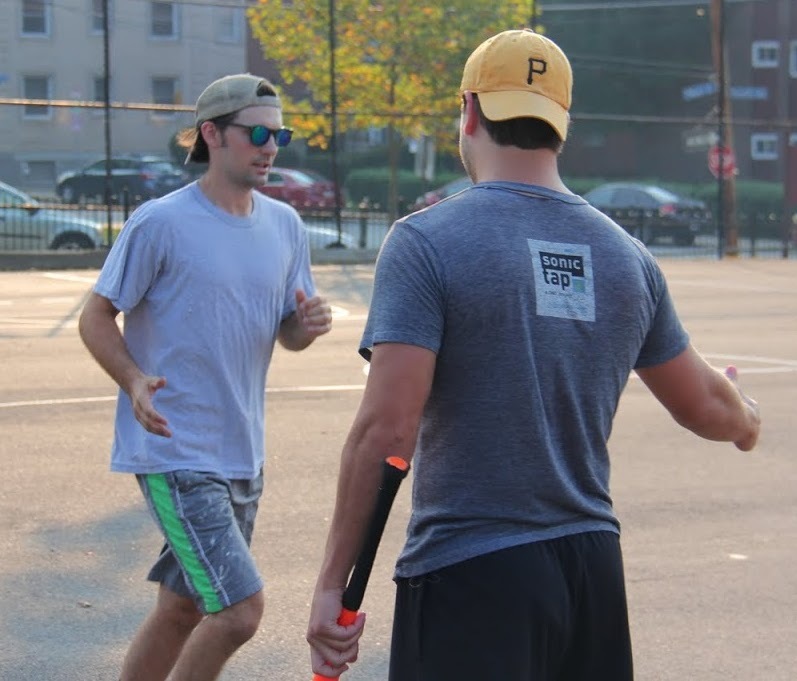 Eastbound & Dahn took a 1-0 series lead over Cookies & Cream after a highly improbable and phenomenally dramatic seven-run rally in the bottom of the sixth inning, as Nate’s walk-off homer gave Eastbound a 13-12 win in one of the most exciting playoff games in league history. The two teams came into their first round matchup on completely different trajectories. 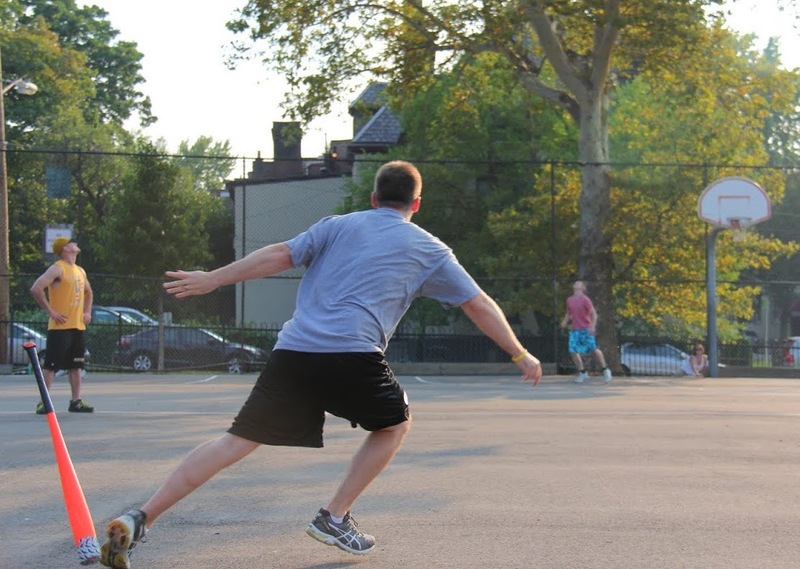 Eastbound had been pummeled in their final two games and would enter the playoffs without their star player, Morrison, who moved to Washington DC weeks earlier. 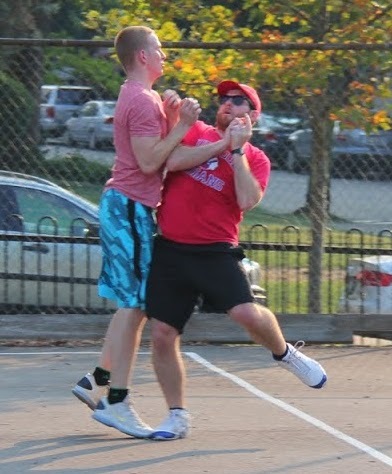 Cookies, on the other hand, had snapped a long losing streak with a blowout win over Eastbound to end the season, and they entered the series with a full roster for the first time in months. In a rare late-season trade, Dustin was claimed off waivers from Cookies & Cream by Eastbound & Dahn, plugging a hole left in their lineup by Morrison’s departure. Helal started on the mound for Eastbound, and Cookies would hit him hard early. Joey led off the game with a solo homer, putting Cookies & Cream ahead 1-0 immediately. Blose followed with a triple, and he scored when Dinger grounded out for the first out of the inning. Guthrie followed with a one-out solo homer, and Cookies led 3-0. Helal then retired Joey to end the inning, but Eastbound trailed by three runs. Cookies & Cream turned to their ace, Guthrie, to start the playoffs, and he retired the side in order in the bottom of the first. Helal got back on track in the top of the second, retiring Blose and Dinger for a scoreless inning. Eastbound got on the board in the bottom of the second, cutting into the Cookies lead. Dustin led off the inning with a triple, and he scored when Christian grounded out for the first out of the inning. Helal followed with a double, but he was caught trying to extend the hit into a triple, and the score was 3-1 after two innings. Joey hit a one-out solo homer, his second of the game, to put Cookies & Cream ahead 4-1 in the top of the third. Helal then retired Blose to end the inning. Eastbound drew even with Cookies & Cream in the bottom of the third with a three-run rally. Tim started the inning with a solo homer, cutting the score to 4-2. Two batters later Dustin hit a one-out single, and Christian drove him in with an RBI triple to make the score 4-3. Helal then hit an RBI single to tie the game at 4-4. Tim followed with a double, putting runners on second and third with one out, but Guthrie buckled down, retiring Nate to end the inning and strand two runners. With the game tied at 4-4, Cookies & Cream exploded for six runs in the top of the fourth to take a commanding lead. Dinger led off the inning with a single, and Guthrie followed with a single to put runners on first and second. Joey followed with a three-run homer, and Cookies led 7-4. Blose then homered, and his solo shot put Cookies ahead 8-4. After a Dinger double, Guthrie hit a two-run bomb to left-center, and Cookies had pulled in front 10-4. Eastbound had seen enough from Helal and turned to Christian from the bullpen. He gave up a single to the first batter he faced, Joey, but then retired Blose and fanned Dinger to end the inning, stranding the runner. Guthrie cruised through the bottom of the fourth, and Cookies led by six runs after four complete innings. Christian continued to pitch effectively in the top of the fifth, pitching a scoreless inning, and the score remained 10-4. Eastbound cut into the Cookies lead in the bottom of the fifth. Helal doubled to lead off, and he scored when Tim hit an RBI triple to make the score 10-5. Nate then hit an RBI single to score Tim, cutting the score to 10-6. Dustin followed with a single, but Nate was caught in between bases on the play for the first out of the inning. Guthrie then retired Christian to end the inning. Cookies would make up the two runs with two insurance runs in the top of the sixth. Joey led off the inning with a single, but was caught trying to advance the hit into a double for the first out of the inning. Blose followed with a double, and he scored from second when Dinger hit an RBI single to make the score 11-6. Guthrie then singled, and Dinger scored from first to put Cookies ahead 12-6. Christian retired Joey to end the inning, and Cookies led by six runs as Eastbound went into their final at-bat. 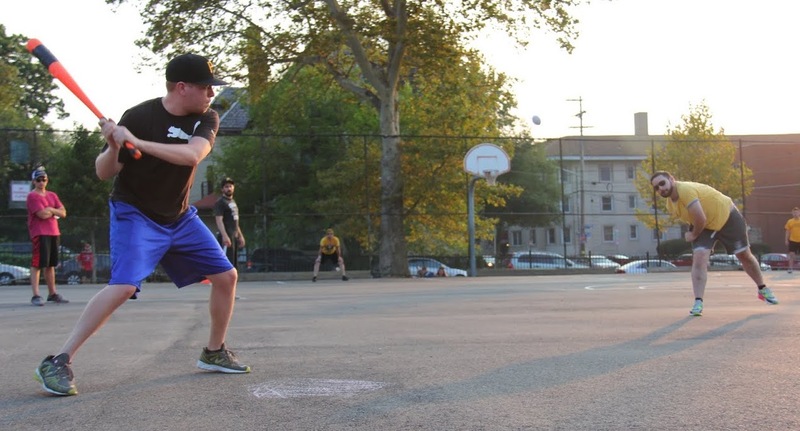 Two outs away from a 1-0 series lead, Cookies proceeded to complete one of the most dramatic collapses in EWL playoff history, as Eastbound put together an epic string of hits to come from behind in the bottom of the sixth in the most improbable fashion. Helal led off the inning with a solo homer, giving Eastbound life and cutting the score to 12-7. Tim followed with a double, and then Nate connected with a two-run blast, making the score 12-9. With their lead cut in half, Cookies removed Guthrie from the mound and brought Blose in for the save. The first batter he faced, Dustin, hit a mammoth solo shot to right-center, and Eastbound had cut the score to 12-10 before recording an out. Blose then retired Christian for the first out of the inning, and Cookies were not one out away from clinching a victory in game 1. Helal then followed with his second homer of the inning, and Eastbound had pulled with a run with the score 12-11. Tim followed with a homer, and the back-to-back homers had tied the game at 12-12. Eastbound had scored six runs in the bottom of the sixth to extend the game at least one more batter. One more batter is all that it would take, as Nate came to the plate and crushed a solo homer to left, his second of the inning, and Eastbound & Dahn had won the game on a walk-off homer. They homered six times in the bottom of the sixth to score a miraculous seven runs and win game 1 by the score of 13-12. – Christian earned the win for Eastbound & Dahn, allowing 2 runs on 7 hits and striking out one in 3 innings of relief. Helal got the no-decision, giving up 10 runs on 10 hits and striking out one in 3 innings. – Blose took the loss for Cookies & Cream, giving up 4 runs on 4 hits in 0.5 innings pitched. Guthrie earned a no-decision, surrendering 9 runs on 14 hits in 5 innings pitched. – Helal led Eastbound & Dahn at the plate, going a perfect 5-for-5 with a single, 2 doubles, 2 home runs, 3 runs scored, and 3 RBI. – Tim went 5-for-6 with 2 doubles, a triple, 2 homers, 4 runs scored, and 3 RBI. – Nate hit two home runs in the bottom of the sixth, including the walk-off game-winning homer. He became the first player since Dinger in 2013 to hit a walk-off homer in the playoffs. – Joey led Cookies & Cream on offense, going 6-for-7 with 2 singles, a double, 3 home runs, 3 runs scored, and 5 RBI. – Dinger tied the record of strikeouts in a game with 2, previously set by Charlie (Ham Slams) in 2013. – Eastbound & Dahn’s 3 triples broke the previous record of 2 set by many prior teams. – Cookies & Cream tied the record for strikeouts with 2, previously set by the Ham Slams in 2013 and 2014. – Eastbound & Dahn tied the record for pitching strikeouts with 2, previously set by Questionable Outfit in 2013 and Cookies & Cream in 2014. 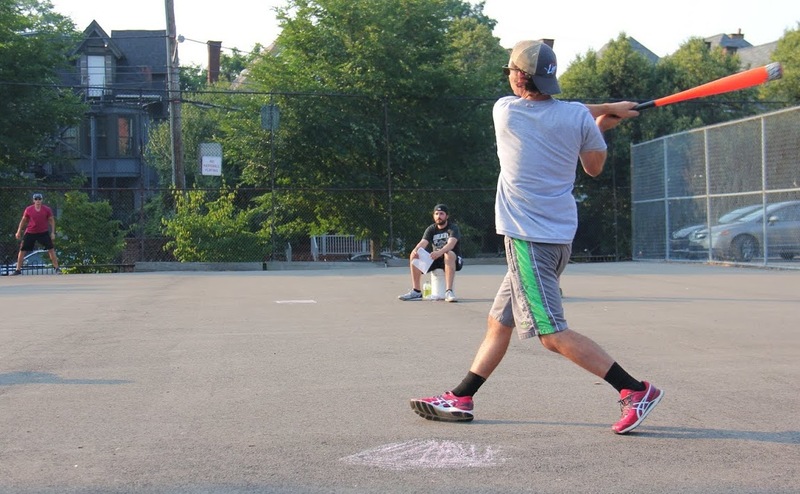 Questionable Outfit, the defending EWL champions, unleashed an offensive attack unlike any the league has ever seen in game 1, as they hit a record 19 home runs en route to a 26-10 win over the Ham Slams. 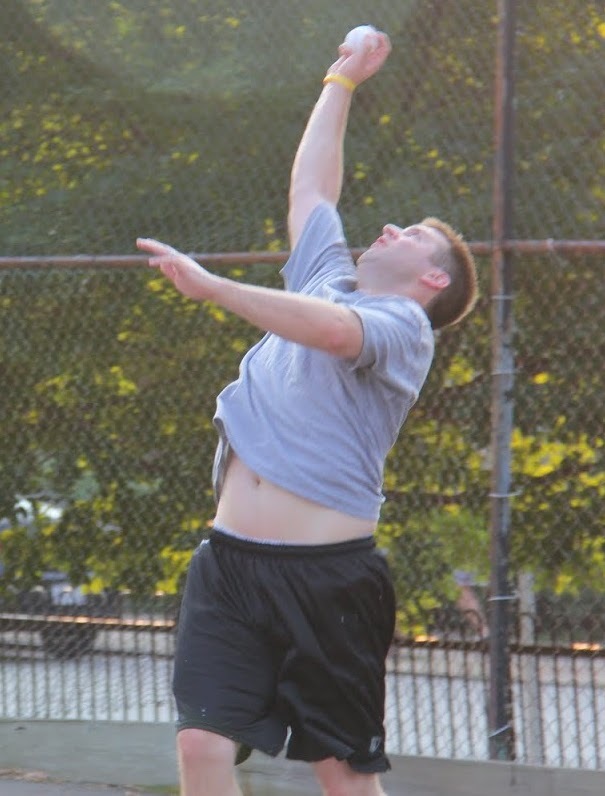 Many of the Ham Slams were playing in their first playoff game, and Questionable Outfit sent them a clear message that they are the favorites to repeat as champions in 2015. 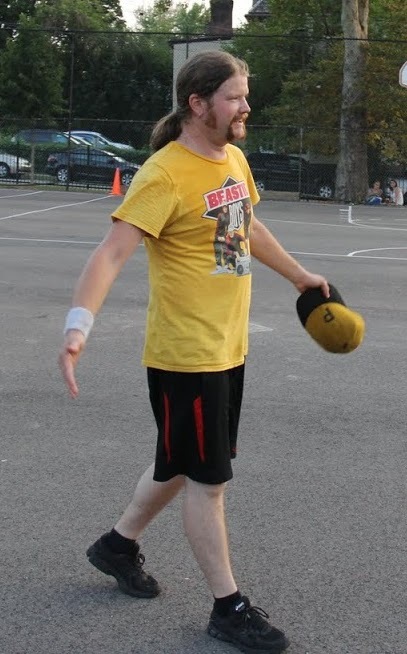 Questionable Outfit shattered many single-game playoff records as both individuals and a team, and the game will go down in history as the most prolific display of power ever exhibited on the wiffle diamond. Questionable Outfit threw a curveball before the game even started, looking outside of their normal rotation of Reilly and Mike and starting Bob on the mound for game 1 of the best-of-five series with the Slams. He used an unusual approach, pitching left-handed to lefties and right-handed to righties, hoping to be more effective than Mike had been in recent outings. He got into trouble early, as the Ham Slams took an early lead. With one out, Dan hit a solo homer to left-center, putting the Slams up 1-0. Alan followed with a solo shot, and the back-to-back homers gave the Ham Slams a 2-0 lead. Adam followed with a single, but Bob retired Steve to end the inning after allowing only two runs. The Questionable Outfit onslaught started in the bottom of the first. The Slams sent Charlie to the mound, and after finishing the regular season on fire, his fire was put out immediately in game 1. Bob led off the game with a solo homer to cut the score to 2-1. Tom followed with a triple, and he scored on a Reilly RBI single that tied the game at 2-2. Mike followed with a single to put runners on first and second, and Bob connected on his second homer of the inning, a three-run shot that put Questionable Outfit ahead 5-2. Charlie retired Tom, but Questionable would add two more runs. Reilly connected on a solo homer, and Mike followed with another home run. The back-to-back homers put Questionable ahead 7-2, and after Charlie retired Bob for the second out, the Ham Slams trailed by five runs after an inning. Tim led off the top of the second with a solo homer, cutting the score to 7-3, but Bob avoided a big Ham Slams rally. He retired Dan, and after giving up a one-out double to Alan, he stranded him by retiring Adam to end the inning. Questionable extended their lead in the bottom of the second. Tom led off the inning with a solo homer, and all four Questionable Outfit players had homered after the Slams had only recorded two outs. Reilly followed with a double and moved to third on a Mike single. Bob was retired for the first out of the inning on a towering fly ball that became a sacrifice fly, as Reilly scored to put Questionable ahead 9-3. Tom then followed with his second homer of the inning, a two-run blast that made the score 11-3. Charlie then retired Reilly to end the inning. The Ham Slams started their second consecutive inning with a homer when Steve led off the top of the third with a solo homer, and the score was 11-4. Bob, however, retired the next two batters to end the inning. Questionable continued to pile on in the bottom of the third. Mike led off the inning with a triple, and then Bob hit his third homer of the game, a two-run bomb that made the score 13-4. Two batters later Reilly doubled, and he scored on a Mike RBI single that extended the lead to 14-4. Charlie then retired Bob to end the inning, and the Ham Slams trailed by ten runs through three innings. For the third straight inning, the Slams got on the board quickly when Alan started things off with a solo homer, making the score 14-5. Two batters later Steve hit a one-out double, but Bob stranded him, and the Slams trailed by nine runs. Questionable had put on a superb display of offense thus far in the game, but the game became legend in the bottom of the fourth. Questionable went on an incredible offensive run as the Ham Slams inexplicably did not make a pitching change, and the game went from a comfortable win to a blow out. Questionable Outfit demolished the record for consecutive home runs, as they started the bottom of the fourth with seven consecutive homers and hit a total of eight home runs in the inning. Tom started the inning with a solo homer, and he was followed by Reilly, Mike, and Bob each hitting homers to make the score 18-5. 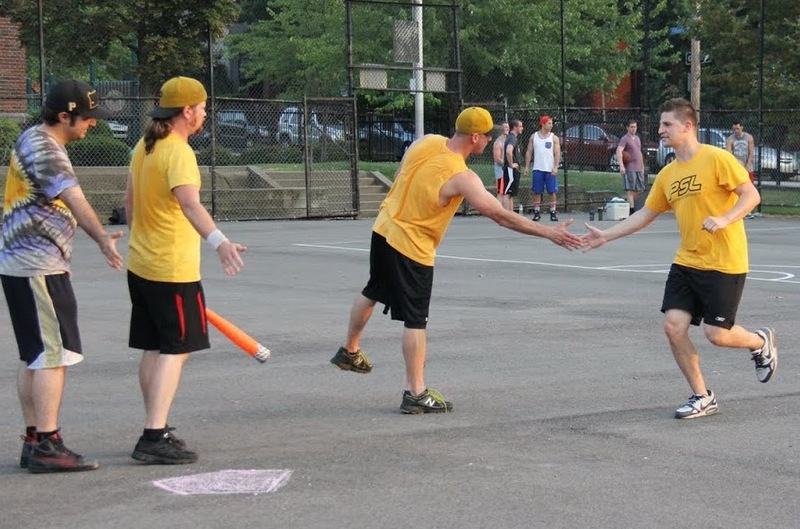 Tom then homered again, as did Reilly and Mike, and after seven consecutive home runs, Questionable Outfit led 21-5. Charlie finally retired Bob for the first out of the inning, but Tom followed with yet another homer, his third of the inning and fifth of the game, and Questionable pulled ahead 22-5. Reilly grounded out to left to end the inning, but Questionable now led by seventeen runs, they had obliterated league records, and Tom had tied the all-time single-game record for homers with 5. 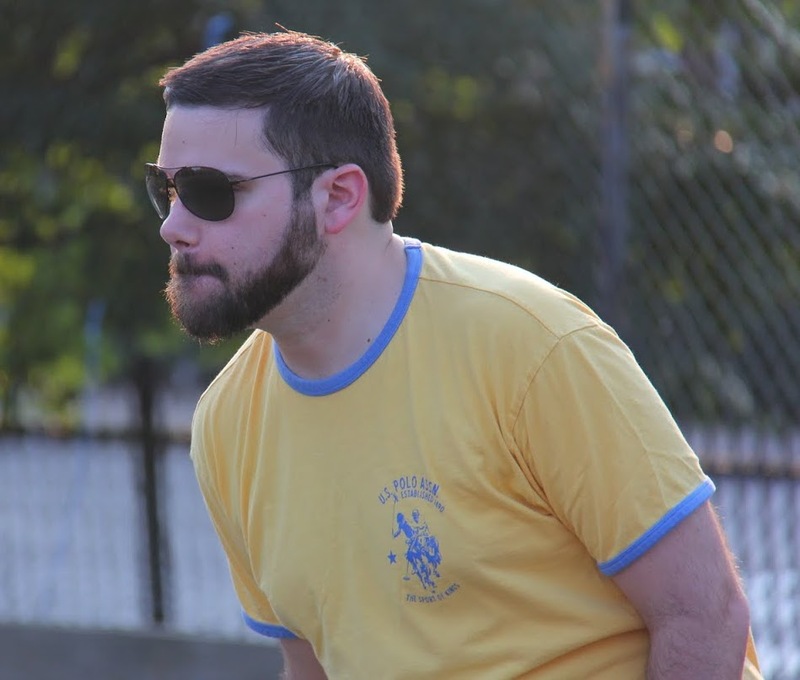 The Ham Slams showed some signs of life in the top of the fifth and maintained respectability. Dan led off the inning with a double, and two batters later Adam singled to put runners on the corners with one out. Steve doubled to score Dan, and the score was 22-6. Tim then hit a three-run bomb, clearing the bases and making the score 22-9. Dan followed with a solo homer, and the back-to-back homers cut the score to 22-10. Bob then retired Alan to end the inning. Up by twelve, Questionable would add a few more runs and a few more lines to the record books in the bottom of the fifth. Mike led off the inning with a homer, his fourth of the game, and the score was 23-10. Bob followed with a homer, tying his own record and his teammate Tom with his fifth of the game. Tom then followed with his sixth home run, breaking the all-time EWL record, and Questionable Outfit had started the inning with three straight homers, making the score 25-10. Charlie retired Reilly for the first out of the inning, but Mike followed with his second homer of the inning and fifth of the game, and the score was 26-10. Bob was retired for the second out of the inning, and Questionable led by 16 runs heading into the final frame. Demoralized, the Slams went quietly in the top of the sixth. Bob retired Adam and Steve consecutively, and Questionable Outfit won game 1 26-10 to take a 1-0 lead in the best-of-five series. – Bob pitched the complete game win for Questionable Outfit, allowing 10 runs on 14 hits in 6 innings. 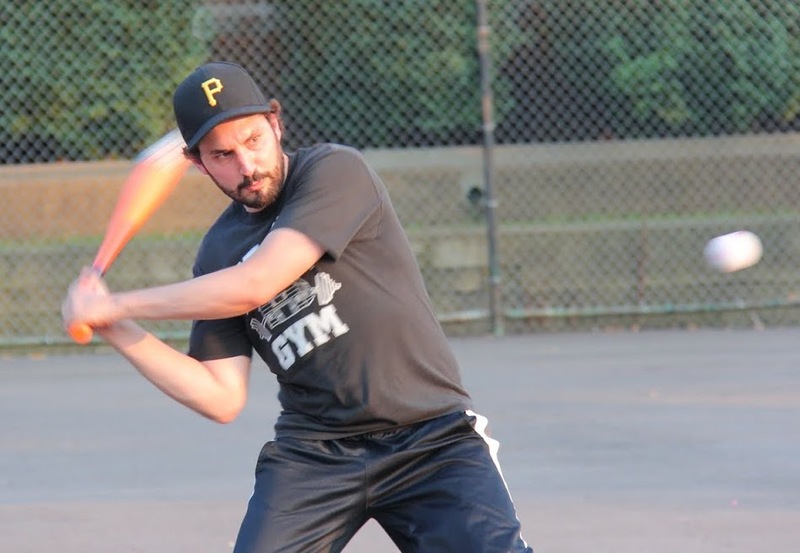 – Charlie took the loss for the Ham Slams, giving up 26 runs on 27 hits in 5 innings pitched. – Charlie and the Ham Slams 26 earned runs broke the previous record of 14 set by Holly and Downtown Bobby Brown in 2012, and the 27 hits allowed broke the previous record of 18 also set by Holly and Downtown Bobby Brown in 2012. 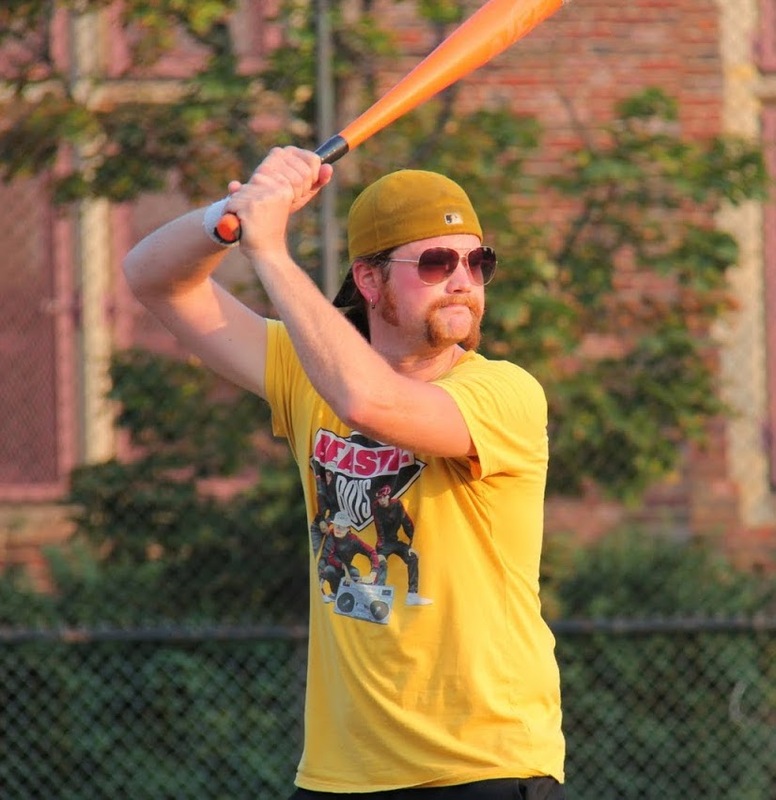 – Tom led Questionable Outfit, going 7-for-9 with a triple, 6 home runs, 7 runs scored, and 7 RBI. He homered in his final four at-bats. 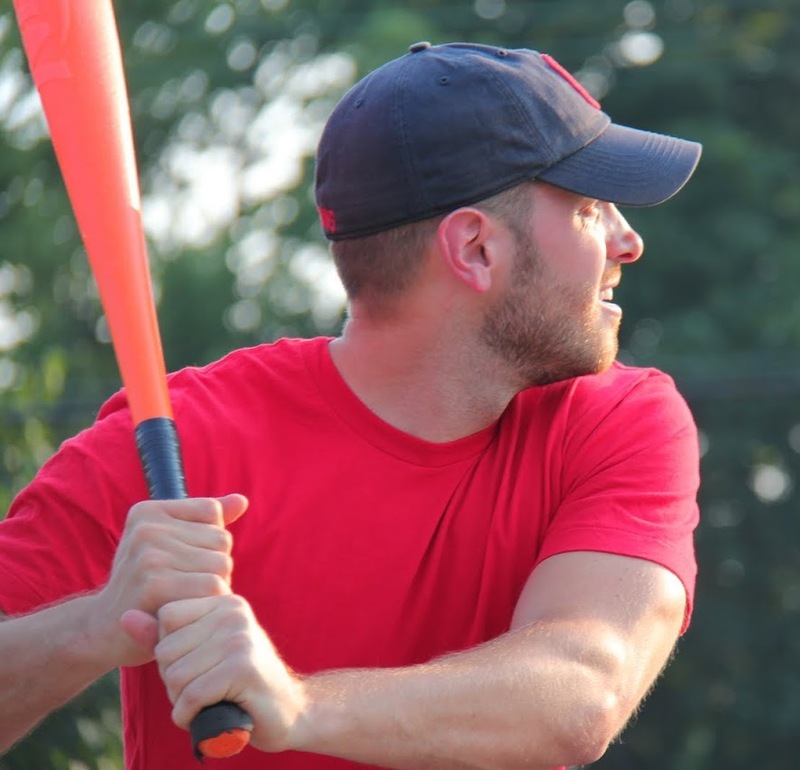 – Mike went a perfect 9-for-9 with 3 singles, a triple, 4 home runs, 8 runs scored, and 6 RBI. He also homered in his final four at-bats. 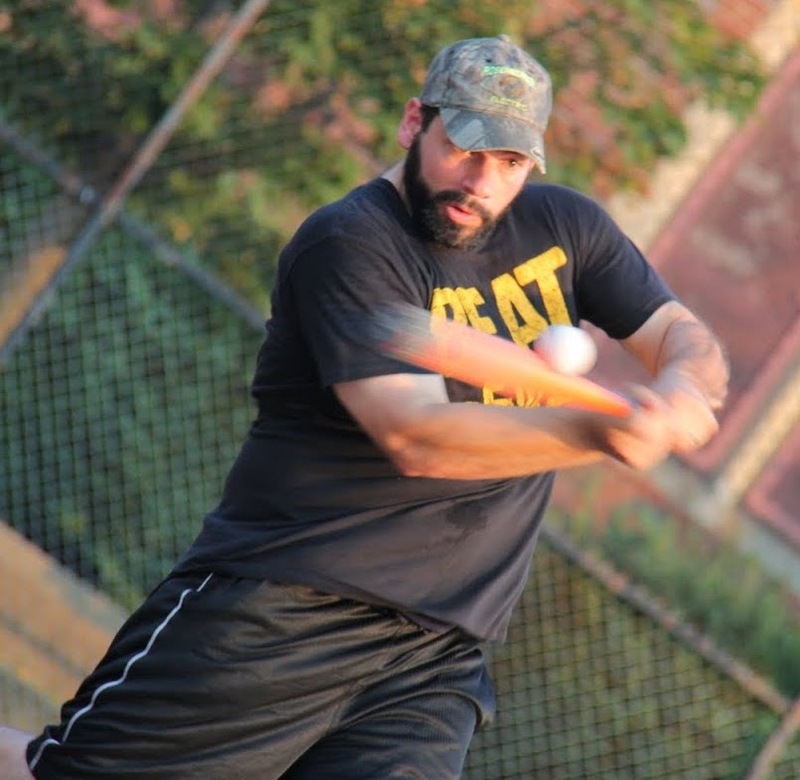 – Dan led the Ham Slams on offense, going 4-for-5 with a double, a triple, two home runs, 3 runs scored, and 2 RBI. – Mike’s 9 hits broke Mark’s (Downtown Bobby Brown) previous record of 8 from 2012. – Mike’s 8 runs scored broke the previous record of 5 held by Guthrie (Caucasians) from 2011, Morrison (Caucasians) from 2012, and Mark (Downtown Bobby Brown) from 2012. – Bob and Mike hit 5 homers and broke the record of 4 homers in a game previously set by Mark (Downtown Bobby Brown), who did it twice in 2012, Steve (Ham Slams) from 2012, Morrison (Cookies & Cream) from 2013, and Guthrie (Cookies & Cream) from 2013. Then Tom broke Bob and Mike’s record by hitting 6 home runs. – Bob’s 9 RBI broke the previous record of 7 set by Morrison, who did it in 2011 (Caucasians) and again in 2013 (Cookies & Cream), and Bob who did it in 2013 and 2014. – Tom’s 27 total bases broke the record of 22 that was set by Mark in 2012 with Downtown Bobby Brown. 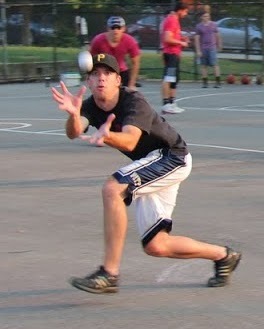 – Questionable Outfit’s 27 hits broke the previous playoff record of 18 set by the Caucasians in 2012. – Questionable Outfit’s 19 home runs broke the previous record of 8 set by Downtown Bobby Brown in 2012 and Cookies & Cream in 2014. – Questionable Outfit’s 7 consecutive home runs broke the previous record of 4 set by 4 out of 5 Dentists in 2011. – Questionable Outfit’s 26 runs broke the previous record of 14, set by the Caucasians in 2012.